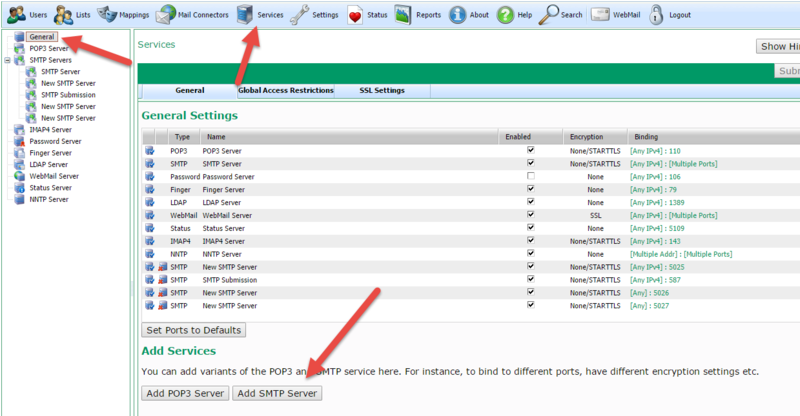 In VPOP3 Enterprise (not VPOP3 Basic) you can create multiple SMTP services. This can be useful if you want VPOP3 to listen on different ports and/or have different settings. This can be useful if you want a single SMTP service configuration to listen on multiple ports, eg ports 25 and 587 or ports 25 and 2525, etc or multiple IP addresses (if your PC is configured with them). 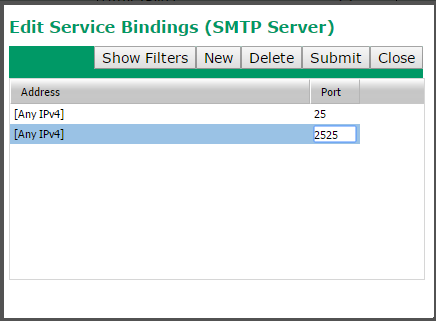 The SMTP service will have an identical configuration on all the ports/addresses. To do this, go to Services in the VPOP3 settings and select the appropriate SMTP service from the list at the left. Now, in the Edit Service Bindings window, press the New button to create a new binding and double-click the Address and Port cells to edit those as desired. Press the Submit button to save the changes. Note that only one thing can listen on an address/port combination, so you cannot have two VPOP3 services listening on the same combination, or VPOP3 listening on the same combination as other software on the same PC. This is useful if you want to have a different configuration, eg different authentication requirements, different access restrictions or different encryption requirements. To do this, go to Services in the VPOP3 settings and select General from the list at the left. At the bottom of the page, press the Add SMTP Server button. This will create a new SMTP service called New SMTP Server in the list at the left of the screen. This will be configured to listen on port 5025 (or the first spare port after that). You can click on that service to edit it as you wish. Often people will just have a single SMTP service listening on ports 25 and 587 with the port 25 configuration above. This is not strictly compliant with the SMTP Submission standard, but may be 'good enough' for most situations, and makes management a bit simpler because there is just one SMTP service.